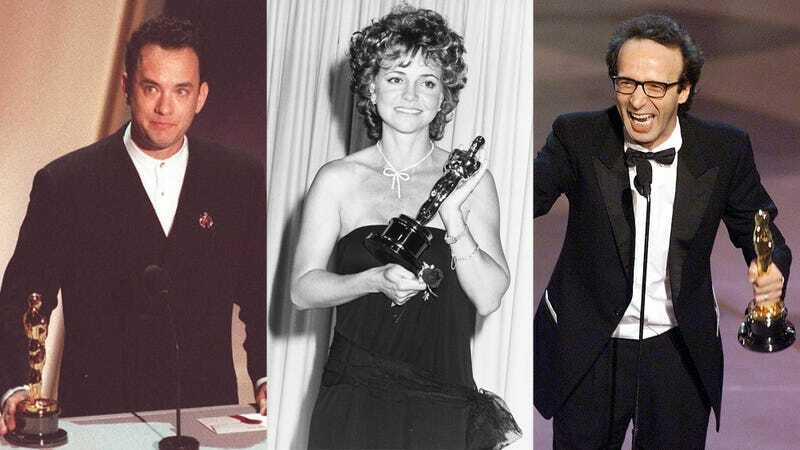 Acceptance speeches are a cornerstone of the Academy Awards ceremony and have provided their share of tears, laughter, and controversy over the years. The Onion looks back at the most memorable Oscars acceptance speeches of all time. Landed in hot water while thanking his high school drama teacher during his acceptance speech for Philadelphia when he inadvertently outed the film’s main character as gay. Really took their sweet time. Was booed offstage after accidentally thanking the Hollywood Foreign Press instead of the Academy. Didn’t give a speech for some reason. The 73-year-old veteran actor memorably conveyed his exuberance by dragging a locomotive onto the stage with his testicles. Kissing Halle Berry during his acceptance speech is renowned as one of the most memorable sexual assaults of an awards presenter in Oscars history. The Italian actor-director famously climbed over the seats to accept his award, and then awkwardly climbed back over them after receiving it. Oscars attendees booed Native American activist Sacheen Littlefeather, who declined the award in Brando’s place, for drawing attention to the fact that they are assholes.